When I came to the physical implementation of the logical design, it looked pretty similiar like it has been drawn in the following figure. The example shows 2 nested ESXi running on my physical ESX01, while another nested ESXi runs on ESX02. My transport VLAN 30 (for VXLAN) is configured on the physical switch and as a VLAN trunk on the distributed / NSX vSwitch of the physical hosts. That’s where our VXLAN-frame will flow between the nested and physical hosts. Of course the MTU size was increased all over the environment (end-to-end). In theory everything should work fine with this setup….buuuuuttt well….it didn’t… and that’s where the funny part began. L2 connectivity between VMs on my VXLANs was not working as expected. Sometimes my virtual machines on a specific VXLAN could reach each other, sometime they couldn’t… that was not very reliable for a robust/reliable protocol like VXLAN is. So it was time to go through all the stuff we learned on the (NSX-) academy. There are a lot of great resources to check / test / troubleshoot problems within the virtual / physical network, e.g. Roi Ben Haim’s great collection of useful L2 troubleshooting tools. All relevant NSX tables (MAC, ARP, VTEP table) had valid data and the increased log-level of the netcpa showed me that relevant information has been exchanged between the ESXi and the NSX-Controller. 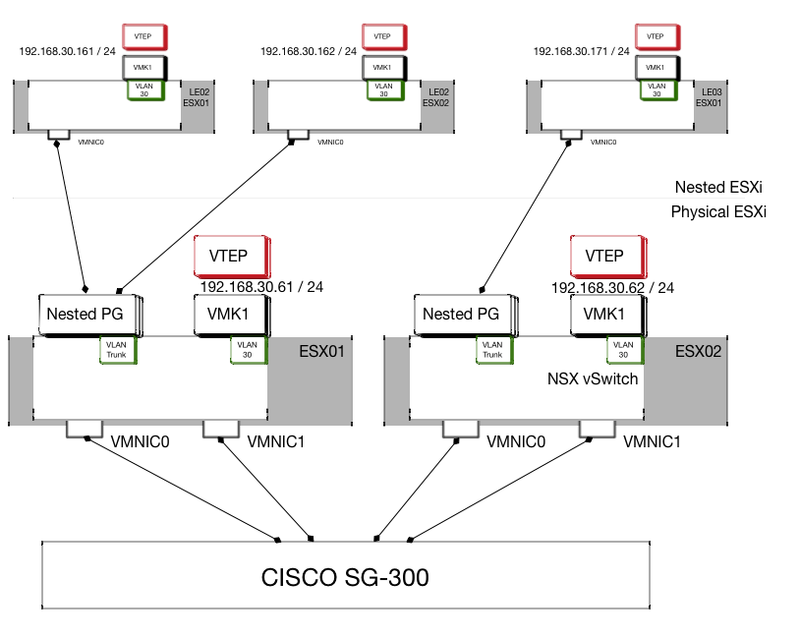 In this scenario every a VXLAN on every ESXi (nested and physical) was able to communicate with each other. This constellation was where it was getting complicated (and to be honest is the scenario where it is important that it works). As soon as the VXLAN frame needed to flow out of the physical host connectivity wasn’t working. And received an interesting output. So it seems that frames from the nested/virtual world have been dropped on the NSX vSwitch of the physical ESXi. It seems that the ESXi is blocking frames that are carrying UDP segments with the port that is used for VXLAN (in VMware’s release: 8472, RFC: 4789). I am still not sure what the exact reason is. If I get more feedback I will add it here of course. The only workaround I figured out (there are some others who made similar observations à should have found / been gone through this article a little earlier. 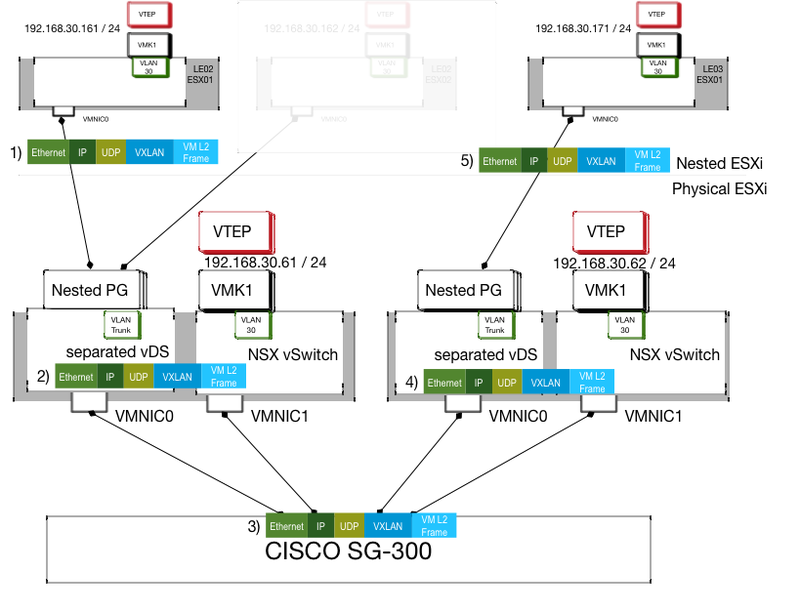 Dmitri Kalintsev came to a similar conclusion) is to separate the NSX vSwitch (including VXLAN portgroups and the VTEP-VMkernel port) on my physical ESXi from another virtual switch that connects the nested ESXi with the transport VLAN. So in case you want to integrate your physical ESXi cluster with your nested ones. Keep those specific dropping characteristics in mind. Especially in Intel NUC scenarios with only a single network adapter another workaround would be mandatory (please comment any suggestions or workaround to avoid the frame-drops). 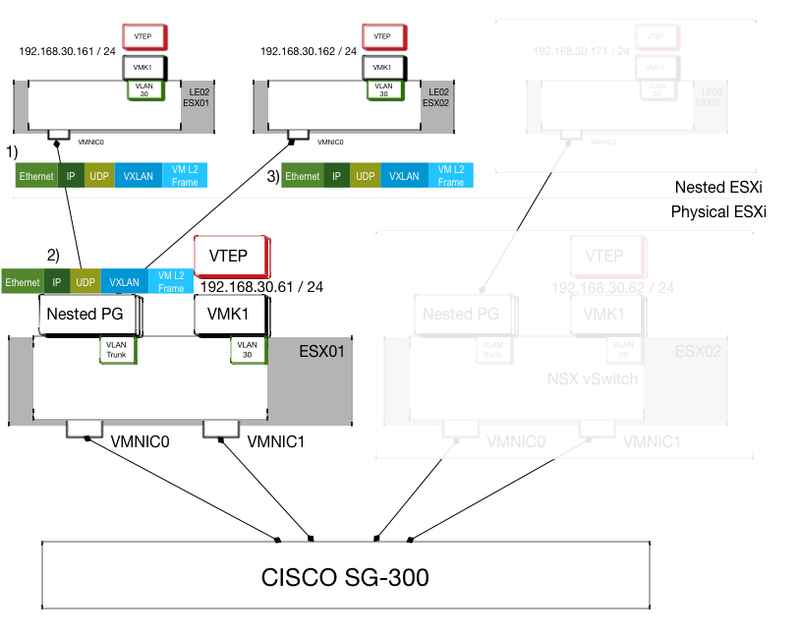 If you want to know WHY you should learn and HOW you can learn more about NSX, check my related blog posts. 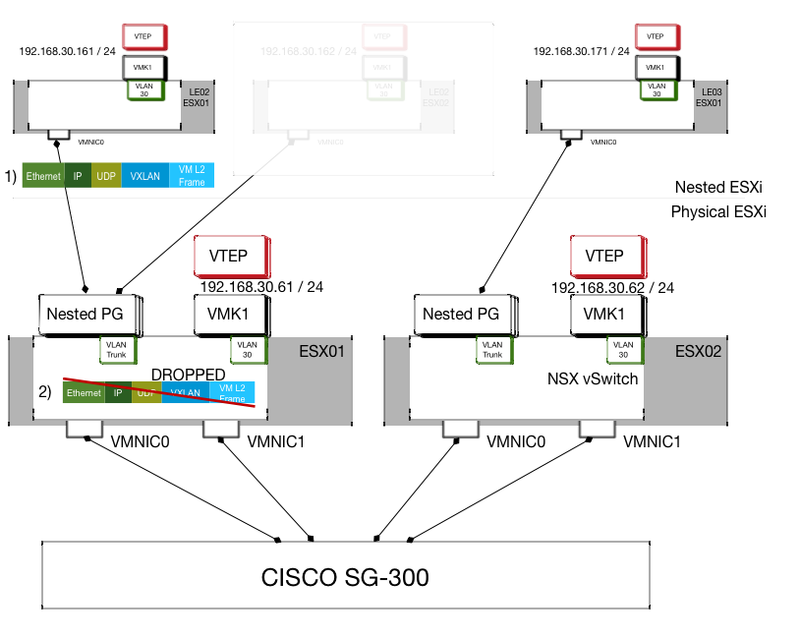 Could you maybe break out a section of the post to detail exactly what must be done to get the nested esxi’s to communicate between hosts using NSX? I see you may have gotten it to work and you troubleshooted a bit, but it’s not exactly clear in the end section what you accomplished, and how it was accomplished. sorry for the late reply. Been quiet busy and your comment just got forgot in my inbox. I cannot guarantees that I can work out a dedicated post about that topic. 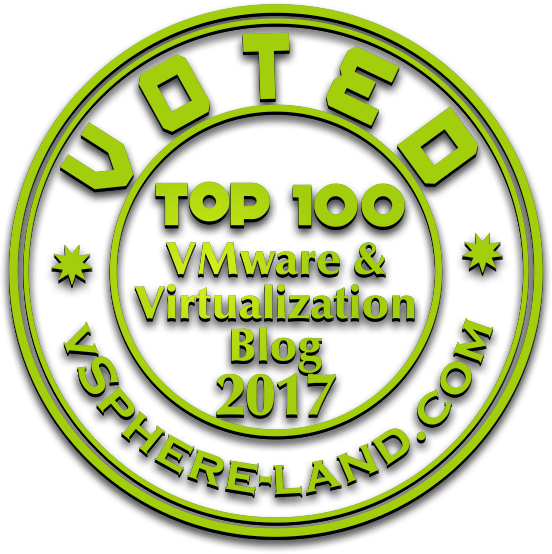 There are a lot of great sources about how to set up the switches within vSphere. I tried to explain on a physical level what must be done (I did not put my focus on how it’s done). 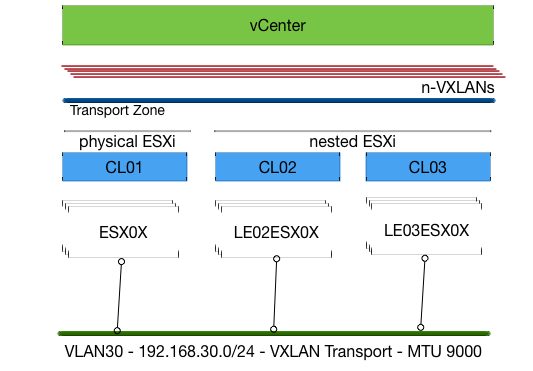 In the end just make sure that the virtual switch where your nested ESXi is connected to (for VXLAN communication) is not the same switch where you configure your VXLAN on your physical ESXi.